Delay in G2 – a rescue compartment? Can giant cells repair DNA? Mitotic death is a delayed response of p53 mutant tumours that are resistant to genotoxic damage. Questions surround why this response is so delayed and how its mechanisms serve a survival function. After uncoupling apoptosis from G1 and S phase arrests and adapting these checkpoints, p53 mutated tumour cells arrive at the G2 compartment where decisions regarding survival and death are made. Missed or insufficient DNA repair in G1 and S phases after severe genotoxic damage results in cells arriving in G2 with an accumulation of point mutations and chromosome breaks. Double strand breaks can be repaired by homologous recombination during G2 arrest. However, cells with excessive chromosome lesions either directly bypass the G2/M checkpoint, starting endocycles from G2 arrest, or are subsequently detected by the spindle checkpoint and present with the features of mitotic death. These complex features include apoptosis from metaphase and mitosis restitution, the latter of which can also facilitate transient endocycles, producing endopolyploid cells. The ability of cells to initiate endocycles during G2 arrest and mitosis restitution most likely reflects their similar molecular environments, with down-regulated mitosis promoting factor activity. Resulting endocycling cells have the ability to repair damaged DNA, and although mostly reproductively dead, in some cases give rise to mitotic progeny. We conclude that the features of mitotic death do not simply represent aberrations of dying cells but are indicative of a switch to amitotic modes of cell survival that may provide additional mechanisms of genotoxic resistance. Following severe genotoxic damage, cells undergo either rapid or delayed death termed by Okada  as interphase and reproductive deaths, respectively. Sensitive cells undergo death within a few hours of genotoxic insult (if the damage is not so enormous as to cause immediate necrosis), whilst damage resistant cells execute death after a delay, precipitating either from the initial G2 arrest or after a number of cell divisions. In lymphoid and myeloid cell lines, all three types of cell death require new protein synthesis and exhibit the DNA ladder characteristic of apoptosis . This delayed reproductive death, also known as "mitotic death", is characteristic of many p53 mutated tumours that are resistant to genotoxic insult [3,4,5]. The main features of mitotic death have been described by several workers [6,7,8]. They include (a) the absence/delay of the G1/S checkpoint and hence (b) the absence of interphase apoptosis coupled to this checkpoint; (c) delay in the G2 compartment followed by its adaptation and hence (d) a sequence of aberrant mitoses which end in mitotic death; (e) formation and disintegration of (multinuclear) giant cells (which is often also termed mitotic death or catastrophe); (f) delayed apoptosis; and (g) finally survival. Given this elaborate sequence of events associated with resistance to genotoxic insult and poor oncological prognosis , it is logical to suggest that these phenomena may contribute to cell survival. To assess this possibility, we must first explore the various facets of mitotic death. Terminal cell death ends any potential for repair or propagation of a cell population and so the earlier death occurs in the cell cycle following damage, the smaller the potential for possible cell survival. From studies of p53, the concept that there is a temporal element to the adaptive response of the cell to damage has emerged, and it has been suggested that there is a "race between repair and cell death" . Therefore, it is clear that to ensure genomic integrity, apoptosis should be tightly coupled to cell cycle checkpoints and initiated rapidly [11,12]. For this reason, apoptosis is mostly precipitated from the G1/S checkpoint in normal, healthy, p53 wild-type cells before segregation of genomes occurs, preventing any chance of potentiating or fixing the damage later in the cell cycle. As such, maintaining genome fidelity puts a tight limit on the proliferative and survival capacity of cells. Conversely, uncoupling cell death from cell cycle checkpoints and delaying the terminal effector stage of apoptosis should give cells a greater chance for repair, diversification of pathways and survival. This latter situation is observed in resistant tumours, where G1/S and S-phase checkpoints fail  and where mitotic death is initiated only at the last stage of the cell cycle, as the term suggests, around the final stages of mitosis. The tight negative correlation between delayed apoptosis and release from G2 arrest in p53 mutant tumours after irradiation (Cragg et al., submitted), and other data [7,14,15] suggest that the main decision for death versus survival originates from the G2/M checkpoint. Thus, reaching the G2 compartment would appear crucial for cell survival and removing preceding checkpoints should increase resistance. Importantly however, these resistant cells have missed the chance of repair in G1 and S.
To repair damaged DNA, the damage must first be sensed. The precise mechanisms for this are not yet clear, although some current data suggests that p53 itself  and repair proteins of the Rad 9 and Ku group, also function as damage sensors [4,17]. Recent evidence also indicates that in S-phase, sensing and repair of strand-breaks competes with continued DNA replication. Therefore, it may be that in resistant tumour cells, damage is not repaired because it not sensed . In support of this notion, comparing S-phase delay for a panel of lymphoid cell lines after a single dose of irradiation, the most radioresistant cells delay least in S-phase and exhibit the most extensive chromosomal aberrations (Cragg et al; submitted). This situation is exacerbated by the fact that conversion of single-strand breaks (SSB) into pernicious double-strand breaks (DSB) and the error-prone trans-lesion DNA synthesis, are probably occurring in this environment [4,19]. It is paradoxical then, that unlike p53 mutated cells, p53 wild-type cells which sense DNA damage and delay for repair in G1 and S, do not recover from large genotoxic insults . Potentially lethal DSB are repaired by non-homologous end-joining (NHEJ) in G1/early S and by homologous recombination (HR), in late S/G2 [18,21]. NHEJ is by definition error-prone and so error-free repair is only possible through HR. Reaching the G2 compartment provides the best chance for error-free DNA repair within the mitotic cycle. Cells with DSB arrest in G2 at the G2/M DNA damage checkpoint  and attempt HR. In fact, it was only recently discovered that HR acts in human cells [18,23]. This HR repair capacity seems to be many-fold more active in p53-mutated tumours than in wild-type counterparts  and therefore, G2 arrest should be considered an important rescue compartment for damage-resistant tumours. In support of this, the ability of various tumour cell lines to accumulate after damage in G2 seems proportional to their clonogenicity (Cragg et al., submitted) and resistance to multiple anticancer drugs , whilst abrogation of G2-arrest potentiates cell death . This type of response, providing maximal accumulation of cells in G2, is due to loss of functional p53 [3,13,25] and perhaps explains why mutations in p53 are selected for during tumour progression. Although possibly elevated in p53-mutated tumours, it is clear that the repair capacity of the G2 compartment cannot be limitless. 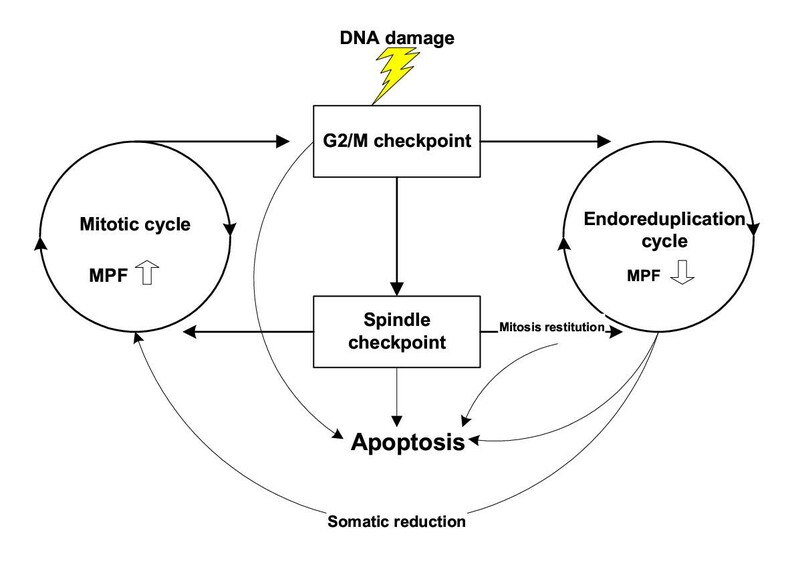 If the damage is too extensive and the cells have overcome (adapted) the G2/M checkpoint, the mitoses that ensue are aberrant due to the genome instability and chromosome breaks. In addition, the ability of chromosomes to stick at breakage sites is often displayed in sequential post-damage mitoses as "bridge-break-fusion" events and it is mostly this process which accounts for a large proportion of first aberrant and then lethal mitoses. All of these facets are due to secondary DNA damage events and represent the "cost" of reaching the G2 compartment. Several investigators have now shown that secondary chromosome lesions and mis-repair directly cause chromosome breaks and evoke "mitotic catastrophe" [2,26,27,28,29]. There are very diverse descriptions of mitotic catastrophe. Initially, mitotic catastrophe was associated with incomplete DNA synthesis and premature chromosome condensation [30,31], with features in common with apoptosis. Other authors define it as an aberrant form of mitosis associated with the formation of multinucleate giant cells that are temporarily viable but reproductively dead [11,32]. Still others state that mitotic catastrophe is pre-determined in G2 and characterised by an abortive short cut into metaphase arrest [33,34]. Mitotic failure often manifests with micronucleation [35,36] and nuclear segmentation  and this in turn, is associated with mitosis restitution into interphase polyploid cells . An apoptosis-like, TUNEL-positive death from metaphase-arrest can often be observed in tumours after various apoptogens . It frequently accompanies mitosis restitution , and is commonly seen during the development of micronuclei and nuclear segments, which are themselves initially TUNEL-negative [40,41]. Clearly, the features of mitotic catastrophe are eclectic . In fact, although these events are usually viewed as deviations from the normal cell cycle, they involve phenomena that are not necessarily associated with mitosis, such as micronucleation, restitution, and polyploidy. Indeed, the last of these is clearly associated with the endocycle, and we would suggest that initiating the endocycle provides an alternative to mitotic catastrophe in resistant cells. Polygenomic giant cells can arise from G2 arrested cells [7,42,43], by cell fusion or by mitotic restitution [38,44,45]. In all cases, tetraploidy appears to be a pre-requisite for initiation of endocycles. True endopolyploids contain several chromosome sets and are usually formed in a series of restitution cycles by (polyploidising) mitoses, which are aborted after segregation of sister chromatids. These cells are thought to be able to return to the diploid state either through mitosis omitting S-phases or by multipolar mitosis . Interestingly, studies on human megakaryocytes in culture  showed that 8N-16N giant nuclei express cyclin B1 and that this co-precipitates with H1 histone kinase activity. Thus, these nuclei retain competency for mitosis and subsequently, multipolar mitoses with centrosomes co-localized with cyclin B follow. For the S-phase 16N-32N cells and for 32N and 64N cells, these activities are strongly reduced. These data are in line with numerous reports that 8N-ploidy represents a general limit, above which cells cannot execute mitosis. 16N-32N cells and cells of higher ploidy are usually unable to divide by mitosis, and therefore belong to the so-called hyperploid class of polyploids . Hyperploidy, which can reach very high DNA content values, is widely observed during the development of transient organs in animals and plants [44,46,48]. Unlike in true endopolyploids, in hyperploid cells, sister chromatids usually do not become separated after replication rounds [44,46,48] and especially if slightly condensed, retain partial cohesion at highly reiterated sites. Most likely, such a polytenic kind of endopolyploidy arises initially from cells arrested in the G2/M or spindle checkpoint and renders these nuclei unable to segregate chromosomes by mitosis. Although mostly reproductively dead, these cells however, can also return to the diploid state, through a specific kind of cell division termed de-polyploidisation, which involves de-polytenization, somatic pairing of homologs and subsequent reduction divisions . Such a process, termed also "meiosis without karyogamy", has been described by Grell in Culex and in the asexual life-cycle of Radiolaria, reviewed in . Although somatic reduction is likely to occur in higher plants, the possibility of a similar process occurring in mammalian cells remained until recently only speculation [42,44]. In malignant tumours, there is often a population of cells with a DNA content above the diploid value of the so-called stem-line and in many cases a number of high-ploidy cells are evident . The proliferative potential of this latter population remains controversial. Some authors claim that high ploidy cells have reduced proliferative potential  or even none at all [53,54]. Others have found that although these cells are usually delayed in, and often deleted from, metaphase, they can proliferate either normally  or through multipolar mitoses , although these observations may refer only to oligoploid tumour cells. We have observed giant cells of 8N-128N and more, as a transient response of p53 mutated human lymphoma cell lines to genotoxic damage or spindle poisons. Within this response, some endopolyploid cells appear to undergo somatic reduction and/or multipolar mitoses and produce mitotic descendants [[41,57], also unpublished]. Therefore, it is important to consider how endopolyploids originate from, and return to, the mitotic cycle, with respect to the different molecular environments required. The mitotic cycle is dependent upon the action of the mitosis-promoting factor (MPF), which is a complex of cyclin B and cdc2 kinase (p34 cdk1). The MPF phosphorylates various substrates including MAPs, lamins, and histone HI, which subsequently induce the spindle assembly, breakdown of nuclear envelope, and chromosome condensation, necessary for mitosis. In contrast, lack of MPF activity and inability to execute mitosis is considered a hallmark of the endocycle [8,42,58]. A recent study of reprogramming the cell cycle for endoreduplication in rodent trophoblast cells has shown that the arrest of the mitotic cycle at the onset of endoreduplication was associated with a failure to assemble the MPF , at the G2/M checkpoint. The same can be achieved by inhibiting cdc2 activity with the kinase inhibitor, staurosporine . The main component of MPF inactivity appears to be lack of nuclear cyclin B1 localisation in the endocycle . For endoreduplication, DNA synthesis must occur independently of mitosis and for this to happen several checkpoints must be overcome. These checkpoints are located in late S-phase (S/M , telophase , centrosome duplication  checkpoints), in G2-phase (G2/M checkpoint , and in M-phase (spindle and post-spindle checkpoints [62,63]). In the endoreduplication cycle, cells shuttle only between G1 and S-phase, with a truncated late S-phase [8,42,44,64] and therefore many of these checkpoints are naturally absent, allowing unchecked DNA synthesis. The MPF also negatively regulates the assembly of the replication complex . Stable overexpression of cyclin E, which is part of the replication complex and the main driver of replication, is a characteristic feature of endocycling and tumour cells [8,58,60,64,65]. Therefore, it seems likely that when DNA synthesis becomes unscheduled, due to the inactivity of the anaphase promoting complex APC and the post-spindle replication checkpoint, this stable and abundant cyclin E down-regulates cdc2 kinase, and thus renders the MPF inactive, enabling decondensation of chromosomes and reset of interphase. Most of the checkpoints detailed above are p53 dependent, and so not surprisingly, the ability to initiate endocycles and form endopolyploid cells is characteristic of cells lacking wild-type p53 function [15,43,66]. Genotoxic damage in particular enhances this transition from the mitotic cycle into the endocycle in p53 mutant cells [15,66]. The arrest in the G2/M checkpoint is known to activate chk1, which induces the phosphorylation of cdc25. This results in cdc2 remaining phosphorylated on Tyr 15, causing its inactivation and through the subsequent molecular pathway, retaining the cytoplasmic localisation (nuclear export) of cyclin B1 . Consequently, DNA damage, causing G2 arrest and preventing MPF assembly, may provide the necessary molecular environment to trigger entry into the endocycle instead of mitosis. Another molecular constraint to overcome, to allow endoreduplication, concerns the APC which couples mitosis to a new round of DNA replication. This function is performed by the targeted proteolysis of several substrates necessary for the completion of mitosis . Arrest at the spindle checkpoint caused by post-damage secondary DNA breaks or by spindle damage, down-regulates APC activity, thus preventing exit from mitosis but allowing entry into the endocycle by the pathways detailed above  and in . In summary, the characteristic features of p53 mutated cancer cells in conjunction with DNA damage, appears to facilitate the molecular environment necessary to provide a shift from mitosis into the endocycle. The main switch-points for these transitions are outlined on Figure 1, although it should be mentioned that apoptosis represents another, third option. The schema shows the available switchpoints from the mitotic pathway to the endocycle in p53 mutant cells and stimulation of this switch by DNA damage. As can be seen, G2 arrested cells can go directly from the G2/M damage checkpoint into the endocycle or go on to apoptose. However, if the G2/M checkpoint is adapted, cells can also enter into mitosis, and from there possible arrest in metaphase. In turn, M-arrest has three alternative exits: to return to the mitotic cycle, to undergo apoptosis or, through restitution, to enter the endocycle. Mitosis restitution is unstable and can be aborted evoking apoptosis. Endocycling cells often precipitate apoptosis, but can also return through somatic reduction to the mitotic cycle. The checkpoint(s) for this last process is unknown. Our own studies (Cragg et al., submitted) have shown that in p53-mutated cells, the radiation dose threshold for entering the endocycle from damage induced G2 arrest is higher than for entering mitosis, and in particular, in more resistant cells i.e. cells can still enter the endocycle after high doses of irradiation. One possible explanation for these data is that the endocycle provides a survival advantage. If giant cells do provide a survival advantage after genotoxic insult, then presumably they must be able to repair DNA. In support of this suggestion, chromatid exchanges have been found between sister chromatids in the endopolyploid nuclei of rodent fibroblasts [68,69]. Importantly, crossing over at each site appears only to occur between two of the many aligned chromonemes on the multichromonemic chromosomes  potentially allowing the production of a fully repaired chromosome. Furthermore, some data suggest that homologous chromosomes, which are randomly distributed in the mitotic cycle of diploid cells , become relocated and paired in polyploids [70,72]. This early data has acquired some recent support  as it has been shown that homologous chromosomes come together in generative polyploids long before meiosis begins. In endopolyploid tumour cells, for recombination and somatic reduction to happen, reorganisation of endopolyploid nuclei should occur to provide pairing of homologous chromosomes. In support of this suggestion, a complex somatic reduction process involving meiotic-like bouquets has been reported recently by our group for some Burkitt's lymphoma cell lines after high doses of irradiation [41,59]. Although initially this process appears extremely exotic, it has serious molecular and evolutionary grounds. An attractive idea linking meiotic recombination with DNA repair in somatic cells was recently proposed by Kleckner  who suggested that crossing over and meiosis both originated during evolution from the necessity to repair DNA double strand breaks in the mitotic cycle. Furthermore, the molecular relationship between meiotic recombination and the mitotic DNA damage checkpoints has now been established . In addition, it is worthwhile to note that the endocycle is probably more ancient than both meiosis and mitosis in evolution  and that somatic reduction introduces elements of meiosis into endopolyploid cells. This latter may be important, as recombination DNA repair by exchange between homologs in meiosis has been reported to be up to 10 times more effective than between sister chromatids . Somatic reduction of endopolyploid cells, including pairing of homologs similar to that in meiosis, may therefore represent an effective means of both DNA repair and return to diploidy and the mitotic cycle. In fact, comparing the efficacy of HR in different cell cycle compartments reported in the literature, it can be inferred that HR efficiency increases from G1 to G2  and then still further from G2 of the mitotic cycle to the endocycle. Possibly therefore, in the race between DNA repair and apoptosis, repair is elevated and apoptosis delayed further and further, allowing this extreme shift into the endocycle to occur in the most resistant tumours. In conclusion, after extensive DNA damage, p53 mutated cells miss DNA repair and apoptosis at the G1 and S phase checkpoints and accumulate at the G2 arrest compartment with point mutations and chromosome breaks. The latter exhibit at the spindle checkpoint with mitotic catastrophe. In the absence of p53, the various phenomena of mitotic death, including mitosis restitution, are induced in an attempt to execute an evolutionarily conserved survival program via transient endocycles. The molecular environment of G2 arrest and restituting mitosis down-regulates MPF activity allowing initiation of the endocycle. The resulting polyploid cells may harbour greater DNA repair capacity coupled with the potential to return to the mitotic cycle and may therefore provide a survival advantage.